Hike along one of Asia’s most stunning volcano chains before spending a relaxing evening at one of the nearby hill resorts. Visit one of the world’s great Buddhist monuments, the Borobudur, and prepared to be overwhelmed by the size of this giant pyramid-like shrine adorned with over 500 Buddha statues. From the crowded, bustling streets of Jakarta to the art deco architecture of Bandung, Footprintfocus Java will help you make the most out of your trip. 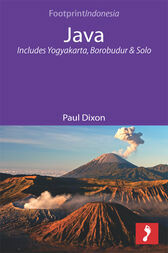 Includes a Background section with fascinating insights into the history and culture of Java. *Essentials section with practical advice on getting there and around. *Comprehensive listings including where to eat & sleep, and have fun. *Detailed street maps for Jakarta and other important towns and cities. Loaded with advice and information, this concise Footprintfocus guide will help you get the most out of Java without weighing you down. The content of Footprintfocus Java guide has been extracted from Footprint’s Southeast Asia Handbook.